As wedding photographers, we attend our share of weddings, and through the years, we have seen wedding trends come and go. However, here are 5 trends that I think are here to stay for a while. So, if you are planning your own wedding and looking for ideas, you may want to incorporate these trends. Often, the bride and bridesmaids wear matching robes, shirts or other attire while they are getting ready for the big day. This allows the bride to not only gift her girls with something nice, but provide a great, cohesive look for pictures. Hendricks County has so many wonderful boutiques and shops that carry cute options for this. Check with your favorite store to see if they will be able to get the perfect outfit for your girls on the big day. One of the newer trends that I don&apos;t anticipate going away anytime soon involves socks. 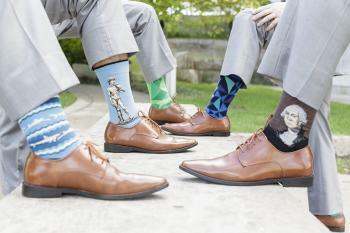 While a wedding day is typically not a day where the guys have a lot of room for self-expression in their attire, fun socks have become a way to do just that. Hidden underneath the crisp suits or tuxes, socks often range anywhere from colorful patterns to sports teams to historical figures. 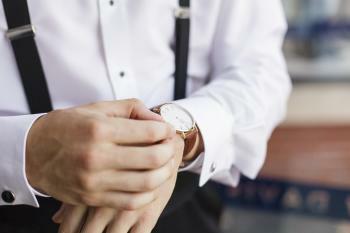 These are often gifts to the groomsmen, and we love the uniqueness and personality that they bring to the wedding day. The details truly make the wedding your own. So, incorporating family heirlooms or other unique touches provide an element no one can replicate. Whether it&apos;s your grandfather&apos;s cufflinks, a piece of your mother&apos;s wedding dress or a grandmother&apos;s handkerchief, if you have meaningful elements that you would like to include in your day, don&apos;t be afraid to do it. If you don&apos;t have any meaningful heirlooms, don&apos;t feel forced to think of something. One of the ways to take the joy out of the planning process is making it too complicated. Your wedding day is your day, so enjoy it and make it your own, however that looks to you. In this age of social media, hashtags have become all the rage and serve a useful purpose. The wedding day will be a whirlwind for the bride and groom. While the wedding photographer will have the main portions of the day covered, seeing the wedding from the guests&apos; perspective should be encouraged. Hashtags provide a great way for all your guests&apos; pictures to be organized so that you can see them later. We even ask for your hashtag in our pre-wedding questionnaire so that we can also tag the pictures that we share on social media. Check with your photographer to make sure you communicate to your guests when it is appropriate for them to take pictures to share as well as what your hashtag is. We encourage guests to take pictures at all times during the wedding day, except during the ceremony, portraits or any time of the day when their pictures may inhibit what we are hired to do. Traditionally, the main reception activities for wedding guests include eating, drinking and dancing. 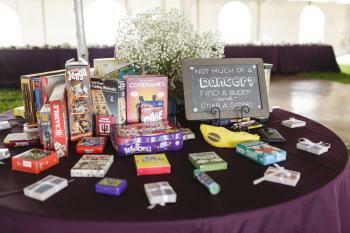 It has become more and more common for couples to provide alternative activities at wedding receptions such as board games, or, in the case of an outdoor wedding, lawn games. This great touch gives guests more options to stay and enjoy the festivities without feeling like they have to hit the dance floor. No matter how you plan your wedding, make it your own, and most importantly, enjoy the process and the big day when it arrives. As always if you need help planning your big day in Hendricks County, Visit Hendricks County provides many free resources including a wedding guide and much more. Click here for more information. Erika, along with her husband, Austin, make up Erika Brown Photography, a photography company who specializes in providing couples an exceptional wedding photography experience before, during, and after their wedding. While Erika Brown Photography is based in Danville, Indiana, they often photograph weddings in Indianapolis, throughout Indiana, and destinations worldwide. They are humbled and honored to have received multiple features and awards for their work.